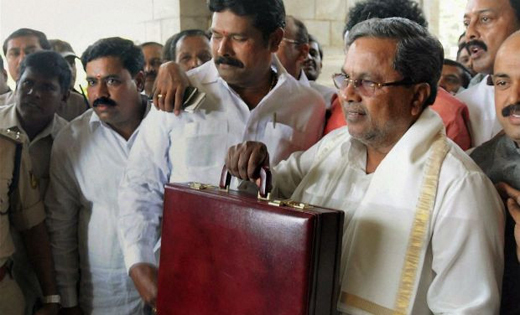 Bengaluru, March 15, 2017: Chief Minister Siddaramaiah presented his record 12th budget, worth Rs 1.86 lakh crore, here on Wednesday. The budgetary allocation is 14.16 percent more than the budget estimates of the previous financial year. With the next elections at the horizon, several initiatives were announced by Siddaramaiah. In order to address the traffic woes of Bengaluru 12 high-density corridors estimated to be worth Rs 150 crores was announced. Apart from Rs 200 crores has been set aside to build 200 kilometre footpaths in the city. Other schemes aimed at the city includes Rs 80 crore for skywalks, taking a cue from Tamil Nadu’s Amma canteen, ’Namma Canteen’ for cheap and affordable food in all 198 wards of BBMP, construction of underbridge and widening of overbridge at Hebbal junction - estimated at Rs 88 crore and others. He also continued to extend support for the schemes introduced by him, such as Anna Bhagya - where the limit of grains for a person has been increase from five to seven kgs. English teaching to be introduced from class one in government schools, free laptops for all undergraduate students, tree parks in every assembly constituency in the name of Saalumarada Thimmakka, free wi-fi to all grama panchayats and ’Mobile canteens’ for SHG’s in every district were also announced. Apart from it, water supply project for 110 villages around Benagluru at Rs 1,886 crore, free 10,000 litre drinking water to slumdwellers was also announced. In the entertainment front, a national annual International Surfing Festival was announced at Bengaluru and it has been made compulsory for multiplexes to screen atleast one Kannada movie. * Free gas connection for 5 lakh poor families not covered under the Ujjvala scheme. * Road Safety Authority will be constituted, to reduce road accidents and to improve road safety. * Rs 20 crore granted for the establishment of Forensic Sciences and Technology Center in Bengaluru. * Separate toilet facilities will be provided for female staff in all the police stations in the state. * Study for Namma Metro phase 3 connecting KIA is complete, and suitable alignment to connect is under finalisation. * Govt medical colleges will commence DNB post graduate course, to overcome the shortage of specialized doctors in govt hospitals. * Spectacles and story books with social message proposed for school children. * One ambulance service will be provided for a radius of 10 to 15 km. * Gold medal winner in Olympics to get Rs 5 crore, silver winner to get Rs 3 crore and bronze winner to get Rs 2 crore. * Scheme for providing hired cycles to be taken up in select areas of Bengaluru. * 100 water bodies to be filled up in deep forest to prevent animal migration. I have not even voted once in my life, as I thought all political parties are corrupt, but comparing current govt( Cong) and previous govt ( BJP), I Personally felt Cong have done very good job, This 2017 budget says it all, as Cong have given importance and benefited to all the sectors, Hence certainly Cong deserves one more chance, and this time I will vote for Cong.